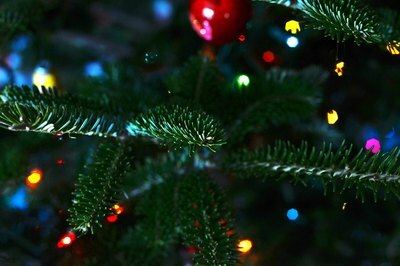 One of the delights of the Christmas season is putting up decorations, including garlanding your home with cheery Yuletide strings of evergreens, popcorn and homemade ornaments. Homemade garlands offer a fun activity to do with family and friends, and the satisfaction of making your own decorations and continuing a Christmas tradition. 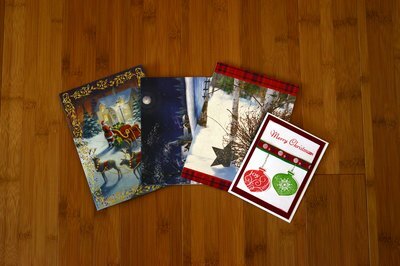 Cut the fronts of old greeting cards into half-inch-wide strips horizontally, discarding the card backs. Punch small holes in both ends of the strips. Stack eight strips on top of each other with the holes aligned, and fix a brad through one end of all eight strips, tightening it on the bottom. Fan out the strips in a circle around the brad, evenly spaced in eighths. Place another brad through just one of the strips’ outer holes. One by one, bend the strips in a semi-circle to the other brad and slip the other hole over the stem of the brad. The strips should be bent as if around a sphere. It may help maintain the form of the ball if you have a floral or craft foam ball to bend the strips around. When all the strips are in place, tighten the brad. To make a garland of these balls, thread a ribbon through them, or tie a string to their tops and hang them from a ribbon or cord. 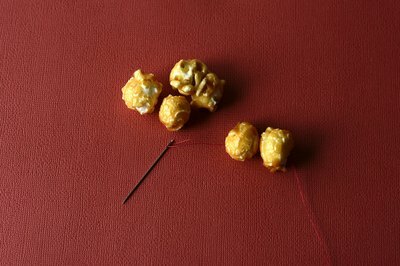 Popcorn strings are the easiest to make: Pop a bunch of unbuttered, unsalted popcorn, and when it’s cool, use a fine needle and thread to pierce through the centers of the popped kernels to make a long garland. You can mix the popcorn with cranberries, which have tough skins and thread well. To make popcorn or cranberry garlands last longer, spray them with a light coat of paint or clear fixing spray. Another edible Christmas garland idea is to use hard candies wrapped in clear or metallic cellophane. Staple two ends of the wrappers together, and then attach another wrapper to the second, and so on until you have a long string. Colorful fruit candies or silver or gold-wrapped toffee candies make for the most festive-looking garlands, and, unlike the popcorn and cranberries, you can eat these after you take the garland down. It takes a while to make your own evergreen garlands, and tender hands should be protected from needles, bark and sap by gardening gloves. You will need a sturdy rope, plenty of floral wire and lots of varied evergreen stems. Mix flat leaves with round, such as cedar and pine together, to give the garland depth and width. Strip the first few inches of the stem to bare branch. Wire the stem to the rope, leaf end away from you, by wrapping it with the wire several times. Place the next stem so that its needles or leaves cover the bare part of the other stem, and wire it in place on the rope. 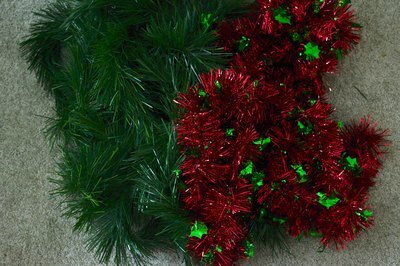 Do two or three layers around the rope, bulking it out into a round shape, before moving down the length of the garland. When you’ve reached the length you want, cover the end with a big bow of ribbon, or wrap the ending stems in thin ribbon.